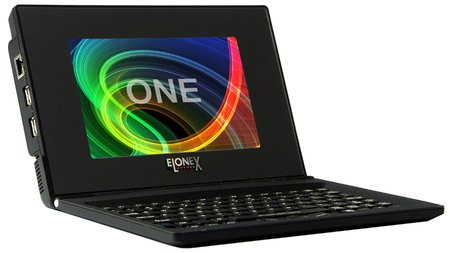 Elonex has rolled out its sub-£100 Linux-based laptop, the One, but it looks like it's going to prove harder get hold of than Asus Eee PC has been. Elonex today unveiled black, pink, green, white and silver Ones to whet buyers' appetites. However, it admitted that the initial batch with comprise just 200,000 machines, none of which will go out to punters until June. Want to get in the queue nice and early? Then Elonex will happily take a tenner and reserve one for you. Elonex at least confirmed the machine's specs: 7in, 800 x 480 display; 300MHz LNX Code 8 processor; 128MB of DDR 2 memory; 1GB solid-state drive; 802.11b/g Wi-FI; 10/100Mb/s Ethernet port; two USB 2.0 ports; and a four-hour, three-cell battery. Elonex said the keyboard is not only removable but "splash-proof", and both halves of the machine sport a "mouse emulator". The LNX Code 8 processor is new to us, too, but at 300MHz, it's not going to challenge the Eee's 900MHz Intel chip much. It runs the Linos version of Linux.